It’s that time again!! Sneak peeks of the C.C. Designs February Release! I just get more and more excited each time because they are so fabulous! This month’s release will have you thinking Fairytales and Spring! With the weather we’ve been having I’m totally ready for Spring too! It seems all the rage lately is alcohol inks and well…. I caved. I grabbed some alcohol inks for my background on my card today. I have no clue which colors these are as I was just playing around but I added some color to my dauber and just swiped across my paper. I thought it created a really unique looking sky background. I trimmed it down so the background didn’t over-power my card and added it to a foam piece before adding to my cardbase. 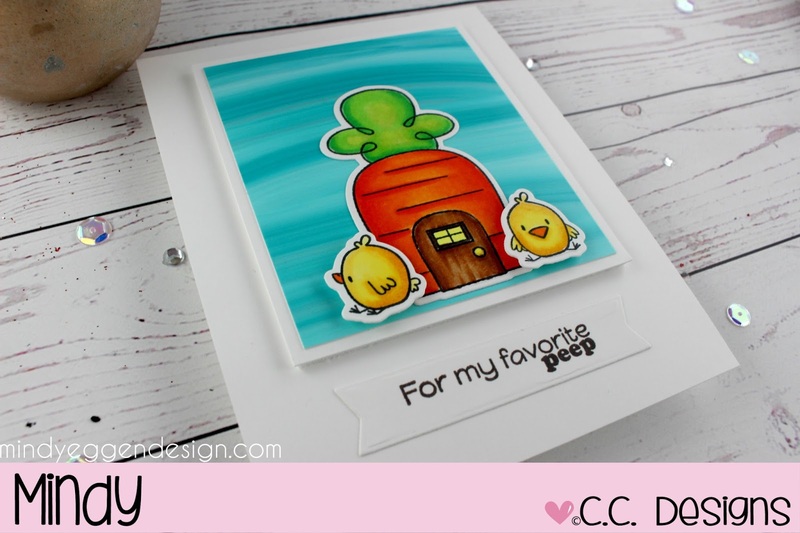 My new release sneak peek is using Easter Cuties and Easter Town Stamp and Die sets. I love that they are coordinating dies for each piece on the stamp set. Makes my life so much easier! I stamped my images onto Neenah White cardstock using Memento Tuxedo Black ink and then colored with my copic markers. I used the coordinating die set to cut them out and add to my background. Something else that is new this month and that I’m totally in love with are the Banner Dies. I love love love Banner dies for my sentiments! 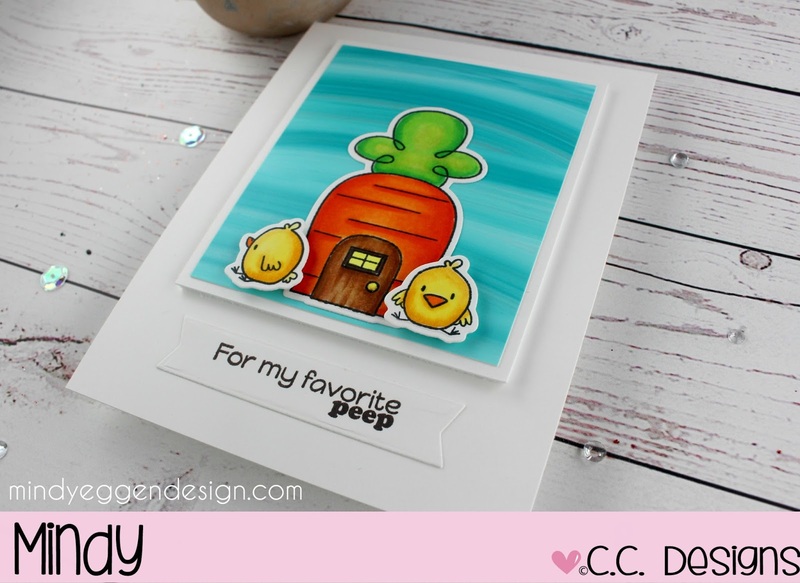 I used a coordinating sentiment from the Easter Cuties set, stamped it onto white cardstock and cut out with one of the banners. There are so many scenes you could create with these two stamp sets! They are a ton of fun! I hope you head to the C.C. Designs Blog and check out some more inspiration from the C.C. Designs Design Team. There is also going to be a Release Party on Thursday, February 8 in the Facebook Events for C.C. Designs starting at 6pm central time. Be sure to stop in as you never know what goodies will be given away! Wanna win some products?! Of course you do! There are plenty of opportunities so be sure to head to the C.C. Designs Blog, C.C. Designs Facebook Group AND the C.C.Designs Instagram account. Trust me, you wanna to win!